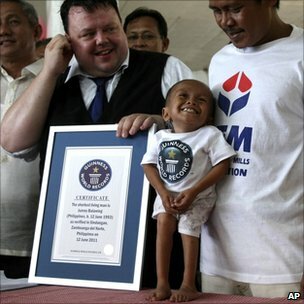 A teenager from a poor family in the rural Philippines has been declared the world's shortest man as he turned 18. Guinness World Records presented Junrey Balawing, who is 59.93cm (23.6 inches) tall, with a certificate at his birthday party. Mr Balawing stopped growing when he was two, his father said. He is more than 7cm shorter than the previous record holder, Khagendra Thapa Magar from Nepal, who had held the record since last October. Relatives say he has difficulty standing and walking, but the community was protective of him. "Officially he is the world's shortest man," declared Guinness World Records official Craig Glenday in front of cheering relatives and friends at his birthday party in the rural town of Sindangan on Mindanao island in the southern Philippines. Well-wishers, including politicians, presented him with cash gifts which his family said would add to their meagre savings, AFP news agency reported. "Thank you to all of you for supporting my son, the world's shortest man," Mr Balawing's father said. Mr Balawing blew out a candle on his birthday cake and said "I'm tired". His father said he had been a sickly child and doctors had not been able to say why he stopped growing. His three siblings are all of normal size.